Clare Boothe Luce; photo taken by Carl Van Vechten, 1933. Clare Boothe Luce (April 10, 1903 – October 9, 1987) was a United States congresswoman (1943–1947), and ambassador to Italy (1953–1957), whose multifaceted career included being a playwright and journalist. As the socialite spouse of Henry R. Luce, the publishing magnate of Time-Life, Inc., she used her position and influence to hone her international peacemaking skills. She was known for her candid outspokenness and sometimes drew sharp criticism for her opinions. Luce was a Renaissance woman who not only "invented" herself but re-invented herself more than once. She struggled from inauspicious beginnings to success in fields traditionally dominated by men. Aided by ambitious perfectionism she overcame many personal obstacles—including a challenging childhood and failed first marriage—to achieve great heights in publishing and playwriting. The tragic death of her only daughter marked a turning point that led her to put her political aspirations aside as she sought answers through nondirective psychotherapy and solace through religion. Ultimately, the Catholic Church renewed her faith in God and gave her the will to continue. One biographer said, "…only through God could she find a reason to live on." Much of her writing from that time onward reflects religious themes. Luce was appointed to the President's Foreign Intelligence Advisory Board under Nixon, Ford, and Reagan. In 1983, Reagan awarded her the Presidential Medal of Freedom. Although Luce is often remembered for her celebrity status, her political views have had enduring impact into the twenty-first century. Ann Clare Boothe, was born the illegitimate child of Ann Clare Snyder and William Franklin Boothe, in New York City. Although her father, a violinist, deserted the family when Clare was nine, he instilled in his daughter a love of music and literature. She was related to the theatrical Booth family, but after the assassination of President Lincoln, members of the family added the "e" to their last name in order to disassociate themselves from John Wilkes Booth. Although her mother struggled to raise her alone, she managed to send her to private schools and augmented her education with trips abroad. Boothe graduated from the "Castle School" in Tarrytown, New York, in 1919, first in her class. Her original ambition was to become an actress and she understudied Mary Pickford on Broadway at age ten, then briefly attended a school of the theater in New York City. It was while on a European tour with her mother and stepfather, Dr. Albert E. Austin, that Boothe became interested in the women's suffrage movement and was introduced to her first husband. Boothe married George Tuttle Brokaw, a New York clothing manufacturer, on August 10, 1923, at the age of 20. They had one daughter, Ann Clare Brokaw. The marriage ended in divorce in 1929, but gave Boothe the financial means to pursue her other passion—writing. On November 23, 1935, Boothe married Henry Robinson Luce, the wealthy and influential publisher of Time, Fortune, Life, and Sports Illustrated. Boothe's second marriage lasted 32 years and produced no children; however, their partnership, focused on publishing, politics, and journalism was a long and productive one that influenced a generation of Americans. On January 11, 1944, Luce's only child and daughter Ann, while a senior at Stanford University, was killed in an automobile accident. As a result of this tragedy, she explored nondirective psychotherapy and religion, joining the Roman Catholic Church in 1946. The Catholic Church gave her faith in God and the ability to continue. Much of her writing from that time onward reflected religious themes. A few years after the death of her second husband in 1967, she moved to Hawaii, but later returned to the East Coast to serve on the President's Foreign Intelligence Advisory Board under Nixon, Ford, and Reagan. Clare Boothe Luce died of brain cancer on October 9, 1987, at the age of 84 in her Watergate apartment in Washington D.C. She was the holder of numerous awards and honors for her contributions to the political and cultural life of America. As a writer for stage, film, and magazines, Luce was known for her skill with satire and understatement, as well as for her humor, which she expressed in oft-quoted aphorisms such as, "No good deed goes unpunished." After her first marriage ended, Clare Boothe resumed her maiden name, and joined the staff of the fashion magazine Vogue, as an editorial assistant in 1930. In 1931, she became associate editor of Vanity Fair, and began writing short sketches satirizing New York society. In 1933, the same year she became managing editor of the magazine, her sketches were compiled and published as the book, Stuffed Shirts. Boothe resigned from Vanity Fair in 1934 in order to pursue a career as a playwright. 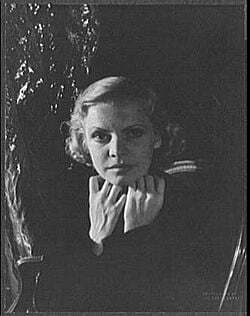 In 1935, after her marriage to Henry Luce, her first play Abide with Me, a psychological drama about an abusive husband and his terrified wife, opened on Broadway. Her 1936 play The Women was a satire of the idleness of wealthy wives and divorcees. Although received coolly by critics, it was immensely popular with the public and ran for 657 performances. In 1938, Kiss the Boys Goodbye, a political allegory about fascism was named one of the ten best plays of the year. In her next play, Margin of Error (1939), Luce depicted the murder of a Nazi agent as both a comedy and a melodrama. It was well received, and, along with the two earlier successful plays, confirmed Luce's status as a leading American playwright. All three were adapted for film. The Women was released by MGM in 1939 and starred Joan Crawford, Norma Shearer, and Rosalind Russell. In 1940, after World War II began, Luce took time away from her success as a playwright and traveled to Europe as a journalist for Life. During a four-month visit she covered a wide range of World War II battlefronts, even taking photographs of some of their more brutal moments. Her observations of the European theater (including Italy, France, Belgium, the Netherlands, and England) in the midst of the German offensive were published as the book, Europe in the Spring, in 1940. In 1941, Luce and her husband toured China and reported on the status of the country and its war with Japan. She also toured Africa, India, China, and Burma, compiling reports for Life. Luce endured the frustrations and dangers familiar to most war correspondents, including bombing raids in Europe and the Far East. During this tour, she published interviews with General Harold Alexander, commander of British troops in the Middle East; Chiang Kai-shek; Jawaharlal Nehru; and General Joseph Warren Stilwell, commander of American troops in the China-Burma-India theater. While in Trinidad and Tobago she faced house arrest by British Customs due to Allied suspicions of the contents of an article Luce was writing for Life. In 1947, after her second term in the U.S. House expired and following the tragic death of her daughter, Luce wrote a series of articles, published in McCall's magazine, describing her conversion to Roman Catholicism. In 1949, she wrote the screenplay for the film Come to the Stable, the story of two nuns trying to raise money to build a children's hospital. The screenplay was nominated for an Academy Award. Luce returned to writing for the stage in 1951 with Child of the Morning. In 1952, she edited the book Saints for Now, a compilation of essays on the lives of the saints written by various authors including Whittaker Chambers, Evelyn Waugh, Bruce Marshall, and Rebecca West. Her final play, Slam the Door Softly, was written in 1970. 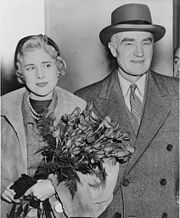 Clare Boothe Luce, ambassador to Italy, with husband Henry Luce (1954). Initially a supporter of Franklin D. Roosevelt, by 1940 Luce felt a change was needed in the White House and campaigned for the Republican candidate Wendell Wilkie. Even though Wilkie lost the election, Luce gained important experience as a political activist. In 1942, Luce won a Republican seat in the United States House of Representatives representing Fairfield County, Connecticut, the fourth congressional district, after being encouraged to fill the seat formerly held by her late step-father. An outspoken critic of the Democratic president's foreign policy, Luce won the respect of the ultraconservatives in Congress and received an appointment to the Military Affairs Committee. Her voting record was generally moderate, siding with the administration on issues such as funding for American troops and aid to war victims. Luce won reelection to a second term in the House in 1944 and was instrumental in the creation of the Atomic Energy Commission. She continued to express growing alarm over the Soviet threat and criticized FDR's foreign policies as "globaloney," a word the press quickly picked up on. Luce returned to politics during the 1952 presidential election when she campaigned on behalf of Republican candidate Dwight Eisenhower. Luce's support was rewarded with an appointment as ambassador to Italy, confirmed by the Senate in March 1953. She was the first woman to represent the United States in a major foreign embassy. As ambassador, Luce addressed the issue of anticommunism and the Italian labor movement and helped to settle the dispute between Italy and what was then Yugoslavia over the United Nations territorial lines in Trieste. Not long afterward, Luce fell seriously ill with arsenic poisoning caused by paint chips falling from the stucco that decorated her bedroom ceiling, and was forced to resign in 1956. Luce maintained her association with the conservative wing of the Republican Party and remained politically active for the rest of her life. She was well known for her anticommunist views, as well as her advocacy of fiscal conservatism. In 1964, she supported Senator Barry Goldwater of Arizona, the Republican candidate for president. She considered a candidacy for the United States Senate from New York on the conservative party ticket; however, in 1964, her husband retired as editor-in-chief of Time magazine and Luce decided to join him in retirement. He died three years later. She served as a member of the President’s Foreign Intelligence Advisory Board from 1973 to 1977, and again from 1982 to 1987. In 1979, Clare Boothe Luce was the first female to be awarded the Sylvanus Thayer Award by the United States Military Academy at West Point. Ronald Reagan awarded her with the Presidential Medal of Freedom in 1983. Among her numerous awards are an honorary doctorate of law degree from Creighton University. Through the Clare Boothe Luce Program, many scholarships and grants are offered to women in the fields of science, engineering, and mathematics. Even after her death, the ideas of Clare Boothe Luce—in both the theatrical and political realms—continue to exert a strong influence over Americans. In 2002, the Roundabout Theatre Company staged a revival of her comedy The Women, which was later broadcast by the PBS series Stage on Screen. Recently, another cinematic adaptation of her play, modeled upon the original George Cukor adaptation, in which Meg Ryan is slated to star, has been discussed. In the arena of politics, Luce's name lives on in the form of the Clare Booth Luce Policy Institute, which espouses much the same philosophy as the late Clare Boothe Luce, both in terms of foreign and domestic policy. Although Luce enjoyed certain advantages in life, she also worked extremely hard at what she believed in. The Clare Boothe Luce Policy Institute "tells young women that if they work very hard and focus on personal and professional goals, they will have successful lives." ↑ Frank N. Magill, ed., Dictionary of World Biography, Vol. 8: The 20th Century (Salem Press, 1999). ↑ Louis Baldwin, Women of Strength (North Carolina: MacFarland and Company, 1996). ↑ The Henry Luce Foundation, Clare Boothe Luce Program. Retrieved June 20, 2007. ↑ KillerMovies.com, Meg Ryan in the Remake of The Women. Retrieved May 6, 2007. ↑ Michelle Easton, Note from Michelle Easton, CBLPI President, Clare Boothe Luce Policy Institue. Retrieved June 20, 2007. Magill, Frank N., ed. Dictionary of World Biography, Vol. 8: The 20th Century. Salem Press, 1999. Sheed, Wilfred. Clare Boothe Luce. New York: E.P. Dutton, 1982. Women Come to the Front: Clare Boothe Luce Library of Congress. About Clare Boothe Luce Clare Boothe Luce Policy Institute. History of "Clare Boothe Luce"
This page was last modified on 23 February 2017, at 17:34.